Control of wastewater is increasingly becoming important to avoid potential environmental and increasing legal consequences. Accurate pH, O2, conductivity and turbidity measurements are critical in modern wastewater treatment. METTLER TOLEDO offers reliable, cost-effective solutions to control industrial effluents. Accurate pH and conductivity measurement is important for determining the state of the raw effluent, for controlling the dosage of chemicals in neutralization and other necessary chemical treatment steps, as well as for monitoring the quality of the final discharge. O2 measuring systems ensure reliable concentration measurement in the biological treatment of industrial wastewater even under extreme conditions. 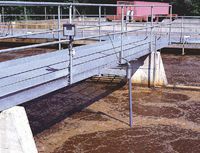 Wastewater treatment procedures demand also measurement of suspended solids and turbidity is a key parameter for monitoring various process stages.